Worldwide icon-chevron-right Europe icon-chevron-right United Kingdom icon-chevron-right England icon-chevron-right London icon-chevron-right Gosh! There’s never been a better time to take up reading comics – and there’s nowhere better to bolster your collection than at this Bloomsbury specialist. Half of the basement room is given over to comics while the other holds a fine stash of Manga. 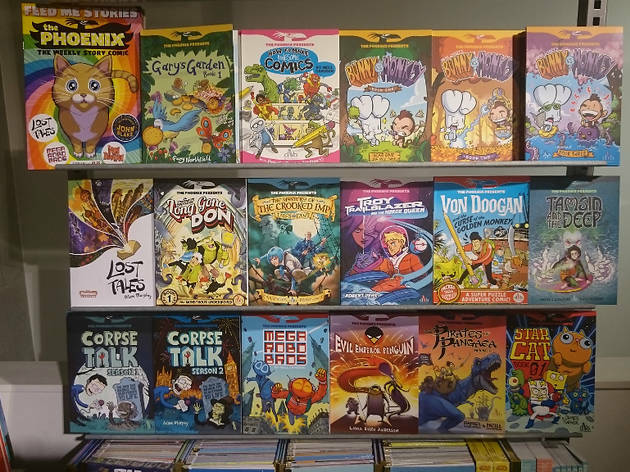 It’s graphic novels that take centre stage, though, from early classics like Krazy Kat and Little Nemo to Alan Moore’s Peter Pan adaptation Lost Girls. The legendary Moore is one of many high-profile authors to have signed here. Bryan Talbot (Alice in Sunderland) is another. Gosh! has begun to sell exclusive bookplated editions of some works – authors sign tip-in sheets that collectors can then add to their copies; plates upcoming when we visited included Mike Mignola and Duncan Fregredo’s Hellboy: Darkness Calls, Nick Abadzis’s Laika and Gilbert Shelton’s Complete Fabulous Furry Freak Brothers Omnibus. Classic children’s books, of the This is London vein, are also a plus point here. Arguably the best comic shop in London. 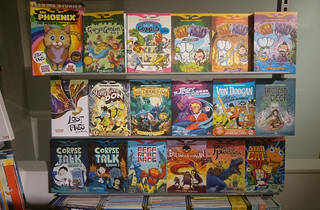 Kids comics and hardbacks, small press, graphic novels and comics as art all there on the ground floor. With the superhero dross safely contained in the basement.